Ulusaba Game Reserve is situated on 13 500 hectares of pristine lowveld wilderness within the renowned Sabi Sand Reserve, adjacent to the world famous Kruger National Park. Ulusaba is owned by the UK entrepreneur Sir Richard Branson, who has ensured that every aspect of comfort and guest satisfaction is exceeded in distinctive style. Ulusaba means “place of little fear”, because the koppie (hill) where Rock Lodge sits provided the ancient Shangaan warriors with the perfect lookout point, and today provides the perfect place for your African Safari. The unique Ulusaba Rock Lodge is an exclusive safari hideaway, distinguished not only by its status as Sir Richard Branson’s private game reserve, but also by having one of the best views in the Sabi Sand Game Reserve. Ulusaba Rock Lodge is perfectly perched high on the summit of a koppie (mountain) with spectacular panoramic views over miles of lowveld bush to the distant Drakensberg Mountain Range. This is a safari lodge with a distinctly African flair where modern and traditional artworks and furnishings run through the lodge and the eight individually designed rooms and suites, which are built amongst the granite boulders, overlooking the waterhole. With all possible comforts including spacious living areas, bathrooms with free-standing baths and separate showers, king size beds with romantically draped mosquito nets and complimentary fully stocked minibar, Rock Lodge is a relaxation retreat. It’s essential to bask in the privacy of your private plunge pool (if your suite has one) as you watch the elephants meander past and marvel over the beauty, of the lowveld below. Incorporated in the main lodge’s design is the granite koppie on which the lodge rests. Under thatch, there is a large African inspired lounge with huge comfortable chairs and open sides to soak in the extensive views. There is a dining room, various outside decks with views, a boma, natural rock swimming pool, fully equipped gym and a spa. As a safari lodge in the renowned Sabi Sand Game Reserve, Ulusaba Rock Lodge offers some of the very best leopard sightings in Africa. Combine that with five star luxury accommodation and outstanding game viewing and you really can't go wrong. At Rock Lodge game drives are conducted daily in the morning and afternoon, and guided bush walks are on request. Ulusaba Cliff Lodge is linked to Rock Lodge by raised wooden walkways, and also offers incredible views over vast stretches of bushveld to the very distant Drakensberg Mountain Range. Booked on an exclusive use basis or as part of Rock Lodge, Cliff Lodge boasts two magnificent suites providing unrivalled luxury. The spacious two-bedroom suite features a private swimming pool and second bedroom for one adult and two children. 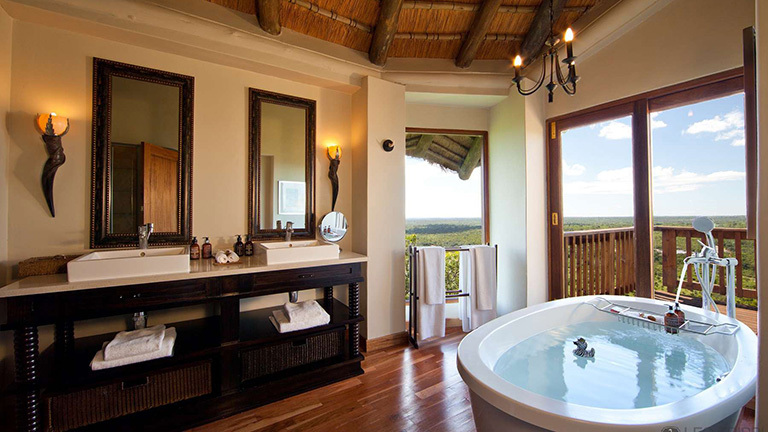 The spacious one-bedroom suite has its own Jacuzzi with stunning bush views. All rooms include en-suite bathrooms, bathroom amenities, air-conditioning, ceiling fan, mosquito net, hairdryer, bathrobes, slippers, snacks, complimentary minibar and tea and coffee facilities. Cliff Lodge can accommodate a maximum of five adults and four children if booked exclusively and will include a private chef and private vehicle for game drives, as well as full use of a private gym and Spa treatment room. At Cliff Lodge game drives are conducted daily in the morning and afternoon. Rangers are on hand to guide guests on safari walks if requested.